Version 4.7 introduced support for customer based paper orders. Previously customer orders were only possible with the Timestone Internet Ordering System (IOS). There are several occasions when a subject's paper orders need to be placed against a customer rather than just the subject. Consider a customer service situation where a parent calls to place a phone order and asks for the order to be shipped directly to them. By adding the parent as a customer, their name and address can be entered and one or more orders can be placed on behalf of the parent. Furthermore packages for multiple subjects (the parent may have several children in that job) can be entered, all part of the one order and all assigned to the single customer. An order header can be printed with the order outlining the customer, subject and order details and can be used as a package or mailing label. In another example, a child may submit two order envelopes on photography day - one for their mother and one for their father - and these orders need to be handled, packaged and dispatched separately. By adding each parent as a customer it becomes a simple matter to keep the two orders separate and ensure the correct parent receives the correct order. Customer based paper orders allow orders for one or more subjects to be placed against the customer. Conversley a single subject may have multiple orders each placed for mulitple customers. The ability to sort the print queue by customer or by order and optionally print order headers at the change of order allows for the easy identification, packaging and shipping of customer orders. Creating customer based paper orders in Details Mode essentially involves creating a Customer then adding orders for subjects in the normal way. All orders will be placed for the customer until a new customer is created or the customer has been 'cleared'. Click the "New customer" button at the bottom of Details Mode or select Orders>New customer from the menu. As soon as a customer is created an order key is generated and displayed with the customers. 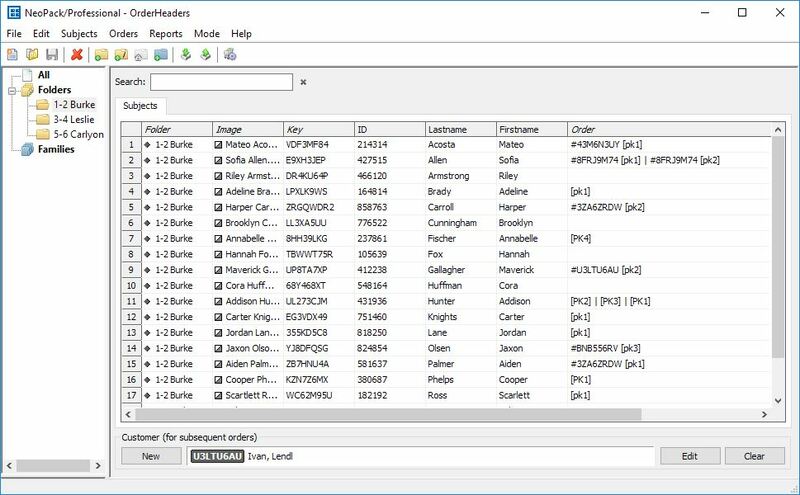 The order key is also displayed in the Orders column making customer orders easily distinguishable from other paper orders. The screen grab above shows Details Mode with a mixture of normal paper orders and customer paper orders. The latter can be distinguished by the presence of the order key. Note order key 3ZA6ZRDW. It appears twice as the customer has ordered for two subjects - Harper Carroll and Aiden Palmer. Customer details can be edited in Orders Mode. Note this applies to online customers as well as customers created in Details Mode. Customer orders appear in NeoPack's Queue Mode where they can printed along with other paper orders and any online pre-orders. Moreover with Version 4.7 it became possible to print order headers in NeoPack in analagous manner to printing online orders in Fulfill. To find an individual customer order use the Find Customer facility. To filter the queue to see only customer orders use the 'Customer' filter. 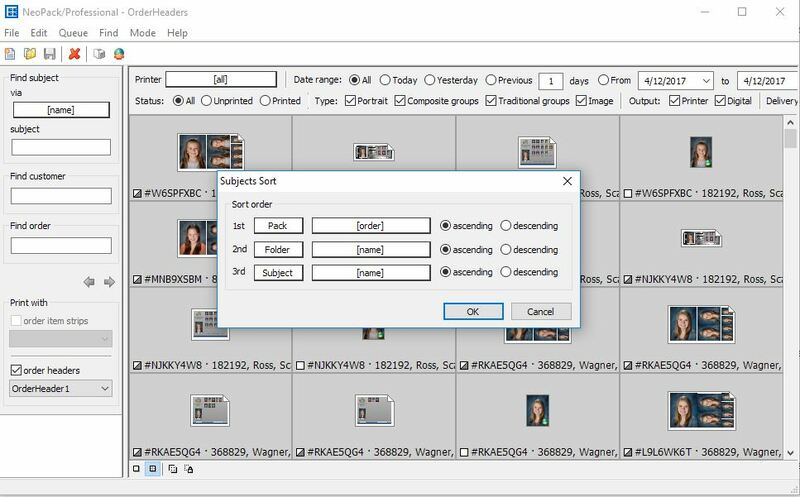 Order headers can be printed for all orders in NeoPack's Queue Mode be they online pre-orders, subject paper orders or customer based paper orders. 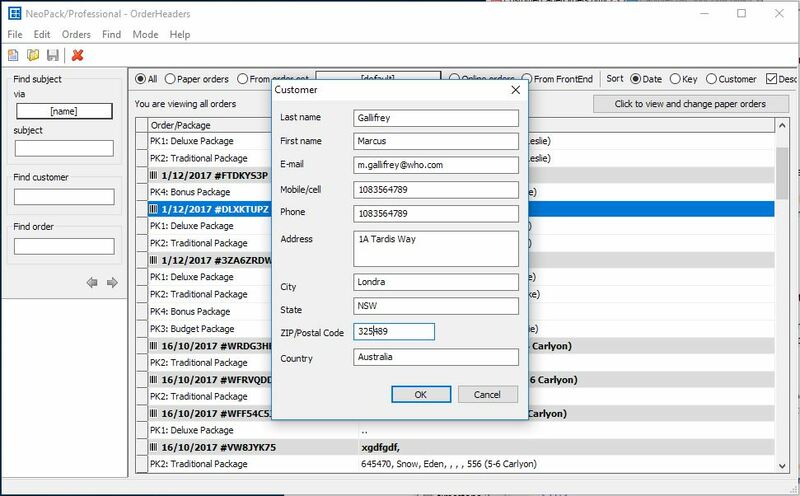 Order headers are particularly useful for online pre-orders and customer orders as they may contain customer information such as names, emails and order addresses. To print order headers check the 'order headers' option in the side bar and select your desired order header template from the drop down list. Order headers print once at the change of an order. With this in mind it stands to reason if order headers are to be printed, the queue needs to be sorted by 'order' so that all the components of that order are together.